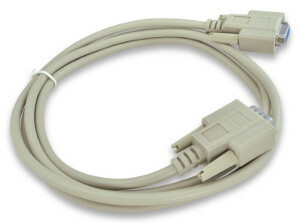 These are extender cables for devices which use a DB-15HD (high density) connector. Although VGA monitors typically use this connector, these cables are not designed for the high frequency signals used in video monitor cables (the monitor would work but you would likely notice "shadows" or "ghosting" on your monitor). These cables are designed for general purpose use (controls, data aquisition, etc). All 15 pins are extended, and the wiring is straight-through (pin 1 to pin 1, 2 to 2, ...) including a foil shield around the cable and connecting the shells. The wire gauge is 28AWG. These cables are beige in color. These cables have 3-row high density connectors. For cables with 2-row DB15 connectors (standard density) please click here. Technically, the correct term for a DB15HD connector is DE15, but that term is not commonly used.